Although European policies promote the development of a knowledge-based society, international comparative studies reveal that large differences exist in the average achievement level and in offering equal opportunities to diverse student populations. 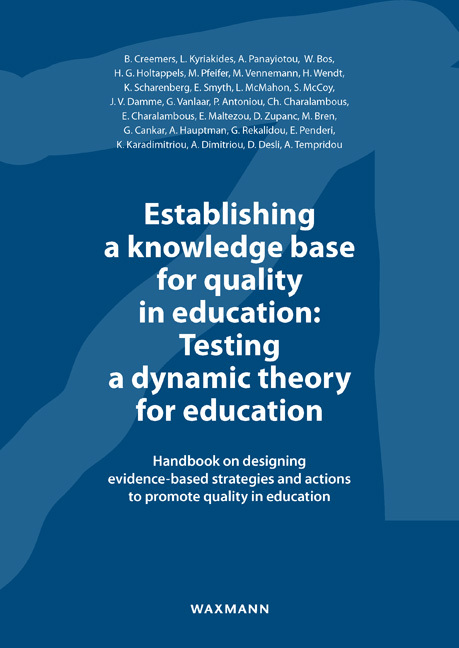 In this handbook we provide suggestions to schools on establishing an evidence-based and theory-driven approach to promote quality in education. Specifically, we offer guidelines to schools on how to establish School Self-Evaluation (SSE) mechanisms measuring the functioning of school factors and identify priorities for improvement. By making use of the knowledge-base of EER, schools are also provided with guidelines on how to develop strategies and action plans to address their improvement priorities. Thus, the main aim of this handbook is to encourage readers, when faced with different challenges/problems, to uncover and exploit the available knowledge-base of EER and to act with flexibility in using the dynamic approach to design, implement and evaluate policies and action plans for promoting quality in education. Contributors: Bert Creemers, Leonidas Kyriakides, Anastasia Panayiotou, Wilfried Bos, Heinz Günter Holtappels, Michael Pfeifer, Mario Vennemann, Heike Wendt, Katja Scharenberg, Emer Smyth, Léan McMahon, Selina McCoy, Jan Van Damme, Gudrun Vanlaar, Panayiotis Antoniou, Charalambos Charalambous, Evi Charalambous, Eliana Maltezou, Darko Zupanc, Matevž Bren, Gašper Cankar, Alenka Hauptman, Galini Rekalidou, Efthymia Penderi, Konstantinos Karadimitriou, Anastasia Dimitriou, Despina Desli, Antiopi Tempridou. Mario Vennemann, Dr. phil., ist wissenschaftlicher Mitarbeiter am Lehrstuhl für Schulpädagogik am Institut für Erziehungswissenschaft der Universität Paderborn. Seine Forschungsinteressen erstrecken sich auf internationale Schulleistungsstudien sowie auf Kontexteffekte in der schulischen Bildung und auf Aspekte des Lehrens und Lernens mit digitalen Medien. Seit 2016 ist er nationaler Projektkoordinator der Studie ICILS 2018. Heike Wendt, Jahrgang 1983, Dr. phil., ist wissenschaftliche Mitarbeiterin am Institut für Schulentwicklungsforschung (IFS) der Technischen Universität Dortmund. Sie ist hier mit der Projektleitung der Trends in International Mathematics and Science Study (TIMSS) 2011 betraut.